The Epsilon 140Z offers an enhanced performance compared to its little sister. 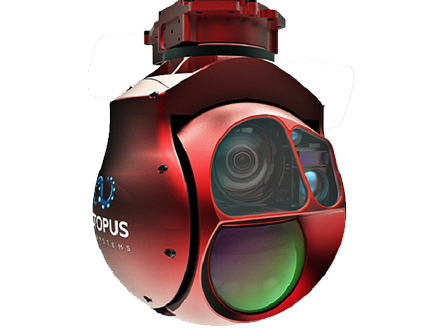 This optronic ball is equipped with a LWIR thermal camera with continuous x3.3 optical zoom in addition to the high-definition x30 optical zoom camera. This sensor duo is supplemented by a laser rangefinder to measure distances to target up to 5000 m, as well as a 50 mW infrared laser illuminator. This ultra-compact ball is perfectly suited for inspections of structures, security of sensitive sites, and medium-range surveillance missions (ISR). Epsilon 140z is available with multiple sensors, including global shutter HD daylight sensor. Epsilon 140z will automatically hold the video centered on the scene, independent of the aircraft movement, even at tele-zoom setting. Epsilon 140z is available with a lightweight retraction mechanism as well as matched vibration isolators. The retraction mechanism weight is 420 grams, with a rugged design and is suitable for high acceleration catapult launches and parachute recoveries. Simply connect the Epsilon 140z to a power, network and serial communication cable – and its ready to use. No need for any additional time consuming integration. Epsilon 140z is capable of hands-free tracking of moving objects. 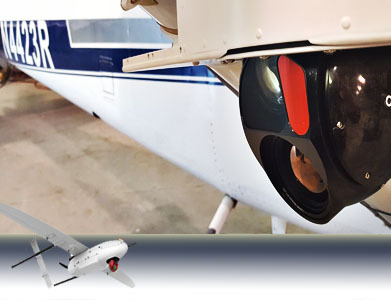 The operator can allocate the target and zoom in, while the onboard processor will hold the target in the center of the video screen, regardless of the aircraft movement direction. This is a fundamental feature for long-range surveillance, monitoring applications and law enforcement applications. Target tracking is paramount in applications where the aircraft is moving, and when the object of interest is moving relative to the ground. You can operate the Epsilon 140z in any conditions – IP64 rated, it has environmentally sealed construction and will protect electronics from dust and heavy rain. The one-piece composite dome design is very robust and optimized for demanding applications were the gimbal needs to handle shock and rapid accelerations. Epsilon 140z will handle routine parachute recoveries, net recoveries, belly landings and catapult launches with ease.